The Broke and the Bookish : Kelly's Review of "Jane Austen: A Life Revealed"
Jane Austen may be the author of easily one of the most popular novels of all time, but how much to her readers actually know about her? In my case, not much. Sure, I knew a few things about her, such as that fact that she never married, and....well, that's it. After finishing Jane Austen, this is in no way true anymore. Catherine Reef's book, while favoring a younger audience, is extremely well written, interesting, and very informative. The book covers Jane's entire life and almost every aspect of it: her upbringing, schooling, parents, siblings, young love, sickness, and of course, her writing. All of her novels are summarized rather extensively; I initially thought this was an unnecessary part to the story, but the author lets the summarizations connect to Jane's life and the modern movie adaptions are also visited. Now we all know that every single one of her six novels focus on young women whose economic and social future depends on the fortune they marry into. While this simple plot may sound trivial and petty to us, this was probably the number one worry of females in this era. Historically, women typically did not inherit anything from their parents, except maybe a small sum of money, so they had to look to potential husbands to assure their futures. The richer the man, the better. If women could not find a husband, they were written off as spinsters and became financial burdens to the family members that had to support them for the rest of their lives. Jane Austen experienced these troubles firsthand; though she received several offers of marriage in her youth, she never married and was passed around from her parents and brothers until her death. The fact that she was still able to inject so much humor and wit into her stories puts her miles above what the typical 'spinster' would have done. She obviously loved her family very much, particularly her fellow unmarried sister Cassandra. Faults? I can only think of one: the pictures included don't really have anything to do with the page they are placed on. You may be reading a section about Jane's writing, and here's a picture of her brother talking about his political career. Sometimes the pictures even served as minor 'spoilers,' alluding to things that hadn't been mentioned yet in the text. Maybe this is only because I was reading an early version of the book, hopefully this is cleared up during publication! I'd give Jane Austen somewhere between 4 and 4.5 stars. Like I said before, it was an extremely interesting read and I learned a lot...so much so that I was able to use some of this knowledge in a paper I wrote for my Theories of Literature class. 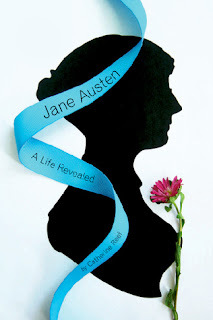 Recommended if you like biographies, history, and obviously, the wonderful works of Jane Austen. One of my goals this year is to read more Austen. This seems like something that I might pick up after I accomplish that goal. I had never heard of it before. Thank you! I saw this on Netgalley and was curious about it. Thanks for the review!